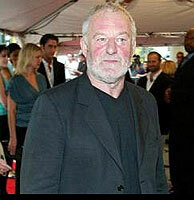 Biography: Bernard Hill appeared in The Ghost and the Darkness, with Val Kilmer and Michael Douglas. Best known for his portrayal of Pauline Collins' husband in Shirley Valentine, Hill's film credits also include Madagascar Skin, Mountains of the Moon, The Bounty and Sir Richard Attenborough's Oscar-winning Gandhi. Hill was nominated for a BAFTA Award for his portrayal of Yosser Hughes in Alan Bleasdale's acclaimed television series Boys from the Blackstuff, for which he also received the Press Guild Award for Achievement of the Decade.